They just turned the power back on by jumpering the transformer that had blown. Thank goodness. We’ll see if the DSL is back on or not when we get back to the house (posting from St. Louis Bread Co (Panera)). We’re still without power at our house. These are pictures of the aftermath of the giant wind storm that left an estimated 450k citizens over 500,000 (including ourselves) without power in St. Louis and the surrounding region. These were all taken within walking distance of our house. All pictures were taken using my Treo 700p. 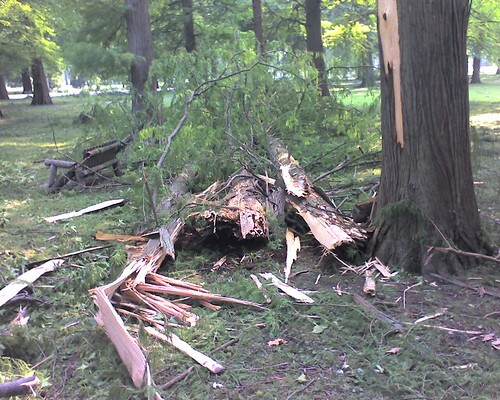 This particular picture is of a tree that was exploded by lightning. 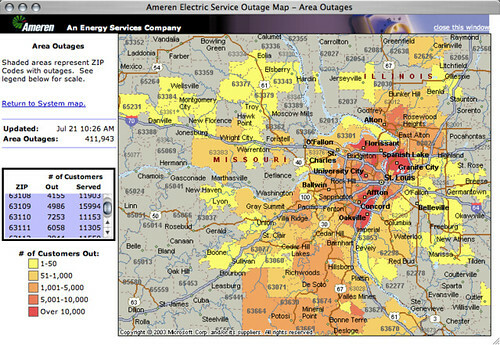 We had a MAJOR thunderstorm rip through St. Louis yesterday that knocked out power, telephone and other services for much of the entire region. Many large trees were literally snapped in half. Tower Grove Park looks like a giant went through it with a baseball bat and started knocking down trees left and right. We’re sitting here in Northwest Coffee in Clayton, they have power (thankfully), air conditioning (it’s supposed to be over 100Â° F today) but their DSL is down. No WiFi, no Internet. I simply hooked up my Treo 700p, enabled USB Modem mode, enabled Internet sharing on my Powerbook, and now I’m serving this small corner of the planet as the only Internet connection. So, if you have a Treo 700p and EVDO service, you too can be an emergency ISP. Due to the enormous windstorm that hit this evening (and possibly some other issue earlier in the day) the power is out on our entire block. Coincidentally, this means that the servers in my bedroom are also off. Where’s your portable backup generator when you need it? Hence, posting this from the Coffee Cartel (open 24 hrs, power + air conditioning, w00t), live internet using the Treo 700p since the ‘free’ internet doesn’t actually seem to be working for some reason. Also, we brought the scanner here so Kristin could finish working on her Mozart kids book. Yay for the Treo 700p. Yay for Mozart. Yay for Coffee Cartel! Excellent show by Ze Frank (the first one I’ve seen) on the good of ugly. Super neato video of a bicyclist doing things with a bicycle that you would never expect.